Technology is changing the way dentists care for and educate their patients. Providence Dental Associates is proud to offer these revolutionary systems to improve your oral health. The television sets in each of our examination rooms are not just there for your entertainment (although we do get cable and are happy to turn on any channel you like). 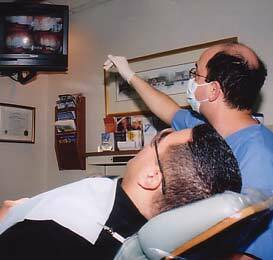 The main purpose of the screens is to monitor the feed from our intraoral camera. The wand-like device is small enough to be placed inside your mouth. With 40 times magnification strength, images taken with the camera enable the doctors to see the smallest details, making your dental work much more precise. 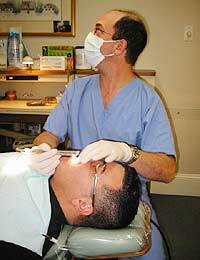 We also store diagnostic still shots of your dental work for your medical records. Even if you’re not having any dental work performed, Dr. Sophocles may use the camera anyway! It’s an excellent educational tool, enabling the doctors to show you the inside of your mouth when explaining information to you. 20/20, the television news program, investigated the water used in dental offices and came up with startling results. Almost 90 percent of the water samples tested did not meet federal drinking water standards, and two-thirds of them contained oral bacteria from the saliva of previous patients. Providence Dental Associates has had a state-of-the-art water filtration system in place for some time now. Rest assured, the water we use during your visits is sterile; in fact, it’s the cleanest you’ll find anywhere.